We recently decided to use the Apache burden basket as a symbol of this restoration project. The drawing above was created by our faithful parishioner and hard working volunteer Bruce Klinekole. The Apache burden basket was a utilitarian tool used for gathering food and other items needed by a nomadic people. 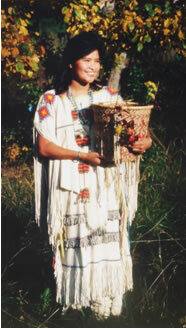 Today the burden basket is used in the female Apache puberty ceremony. Filled with treats it is poured over the head of the girl becoming a woman during the ceremony as a sign of the blessing for good health and long life. These same people who renew my strength with their messages of inspiration came here heavily burdened with life’s problems; and here they found rest. People came here to honor veterans, who have carried the burden of pursuing peace in a world of conflict. People came here both to find blessing, and to experience that blessing being poured over them in abundance. Yes, this Mission is both burden and burden-carrier. In the end however, the burdens carried far outweigh the labor required. Sharing the burdens and the blessings are the reasons for this newsletter. Thank you for sharing our burden of stewardship, so that this sacred and cherished place may continue to hold and bless the human burdens that we all carry on this nomadic journey of life. NOTE: There will be navigation links at the top and bottom of each PDF to navigate through the issues or get back to this page.